Drakenstein Stud’s young stallion Futura made a big impression with his first yearlings at Wednesday’s Cape Premier Yearling Sale. The champion son of Dynasty had members of his first crop fetch up to R1 200 000 at the one day sale. Futura’s top priced lot at Wednesday’s sale, a colt named Warrior (Lot 123) was knocked down to Peter Doyle and Diane Nagle. Another colt (Lot 215) by Futura, the Avontuur consigned Avenir, was knocked down to Rathmor Stud for R500 000. 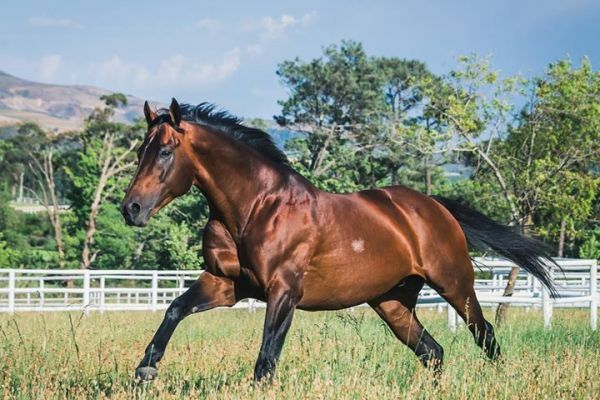 One of the very best sons of multiple Equus Outstanding Stallion Dynasty, Futura was an exceptional athlete who was South Africa’s Horse Of The Year in 2014-2015, and was also named Champion Older Male and Champion Middle Distance Horse. The handsome bay, who has let down into a magnificent individual, won or placed in 16 of 18 races and earned over R4.3 million in stakes, with Futura’s greatest wins coming in the G1 L’Ormarins Queen’s Plate, G1 J&B Met and back to back runnings of the G1 Champions Cup.